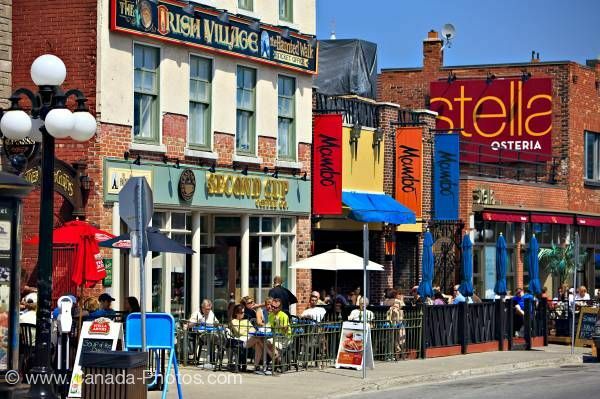 Photo of a Cafe/Restaurant is part of the busy Byward Market, city of Ottawa, Ontario, Canada. A gorgeous sunny day as people enjoy their meals at the busy restaurants and cafes along the Byward Market in the city of Ottawa. Colourful signs are displayed on brick exteriors along with equally colourful umbrellas among the tables. In the foreground, a decorative lantern adds to the charm of the Byward Market. Cafe/Restaurant at the Byward Market, City of Ottawa, Ontario, Canada.